We’d love your help. Let us know what’s wrong with this preview of Pray for Me by Robert Moynihan. On March, 13, 2013, 115 Cardinals elected for the first time a Pope from outside of From the founder and editor of Inside the Vatican magazine, the world's most well-informed, comprehensive monthly on the Roman Catholic Church, comes this enlightening introduction to the life and spiritual teachings of Jorge Mario Bergoglio, now Pope Francis, the first Pope of the Americas. To ask other readers questions about Pray for Me, please sign up. Has anyone read this book? What did you think of it? Good for a prayer group? The writing was 3 stars in this. But the message was definitely 4 stars. I enjoyed learning about the new pope. His story felt inspiring. He has a built a great platform. I hope he is able to accomplish and make progress in the avenues he has designated as a priority. He sounds like such a humble man who is so willing to do what he has been guided to do. And the new pope is a good cook apparently! It's a really good book to introduce a highly spiritual individual; look at his conduct, biography, and approach to the catholic insititution and the modern world. A highly recommended read! I was one of the lucky First Reads winners to receive this book about our new Pope, and it did not disappoint! This is a great introduction to the life and pontificate of Pope Francis... I really like that the author divided it into three sections: first days after his election to the Papacy, his life prior to the election, and quotes taken from his writings and speeches... I grew to love him even more than I already had. He is truly a beautiful, joy-filled, Christian man that we have the blessin I was one of the lucky First Reads winners to receive this book about our new Pope, and it did not disappoint! This is a great introduction to the life and pontificate of Pope Francis... I really like that the author divided it into three sections: first days after his election to the Papacy, his life prior to the election, and quotes taken from his writings and speeches... I grew to love him even more than I already had. He is truly a beautiful, joy-filled, Christian man that we have the blessing of leading us in this difficult time in the life of the Church. Pope Francis has made quite a stir since becoming Pope in early 2013. This book looks at his first few weeks and past. Beautiful and inspiring, this book helps you to understand this strong and novel man. I was impressed with the personal insights this journalist included in this portrait biography of Jorge Mario Bergoglio, the Argentine Bishop who became the current Pope Francis. He covered Bergoglio, traveling with him and studying his life in depth. Moynihan has reconstructed a sympathetic portrait here that provides an unusual look into the personal faith and devotional concepts and commitments of Pope Francis. He probes motivations from Bergoglio's early, consistent devotional and moral persp I was impressed with the personal insights this journalist included in this portrait biography of Jorge Mario Bergoglio, the Argentine Bishop who became the current Pope Francis. He covered Bergoglio, traveling with him and studying his life in depth. Moynihan has reconstructed a sympathetic portrait here that provides an unusual look into the personal faith and devotional concepts and commitments of Pope Francis. He probes motivations from Bergoglio's early, consistent devotional and moral perspectives and activism in his ministry. The author includes a large selection of various pronouncements, sermons, public statements by Bergoglio during his life, giving us a good opportunity to see the focuses he valued and causes he championed in his native Argentina, long troubled politically and economically. The author also reports and evaluates responses, both negative and positive, to Francis' attempts to reach outside the traditional Catholic lines, to cut through protocols, and relate more personally to non-Catholics and non-Christians to open communication. The overt breaches of protocol Francis has now become known for are reflect a consistent commitment to a servant approach to leadership demonstrated in Jesus' life. He emulates also the other famous Francis, from Assisi in Italy, known likewise for his reflective and servant-oriented activism. Rather than just an informative read about a current world religious leader, this became a reflective devotional opportunity for me also, belying some of the stereotypes of the Catholic church based on medieval or premodern failures now well-known to us. It was stirring to read the accounts of the early days of the papacy of Pope Francis, especially the day of his election. I felt like I had been transported back to March 13, 2013, when I was in front of the TV for nearly 2 hours watching the proceedings. Do not like this pope. Does not mean this book was not great. Because it was well written. This is an incredible man, only if everyone would have his strength and belief and his dedication to helping the poor. (and I am not even catholic). Even in the field of religion we find authors who feed our need to be a part of a microwave/instant world. Here is a book on the first two weeks of the papacy of Pope Francis. In fairness, this book is actually designed to introduce the English-Speaking world to the first Pope from the Americas, Argentinian Bishop, Jorge Mario Cardinal Bergoglio. The picture that it provides is an intriguing one. He captured the hearts and imagination of much of the world when, upon his election by the College of Even in the field of religion we find authors who feed our need to be a part of a microwave/instant world. Here is a book on the first two weeks of the papacy of Pope Francis. In fairness, this book is actually designed to introduce the English-Speaking world to the first Pope from the Americas, Argentinian Bishop, Jorge Mario Cardinal Bergoglio. The picture that it provides is an intriguing one. He captured the hearts and imagination of much of the world when, upon his election by the College of Cardinals, he began with a humble request for prayers. Hence the title of the book. Pope Francis quickly made it clear that it is not necessarily business as usual in the Vatican. He has eschewed many of the traditional trappings of the Papacy and instead immediately has emphasized where he comes from, as a servant of the poor, the needy, the people Jesus sent all priests to serve. The speed at which this book was produced is a testament to the information age. Not that long ago it would have taken a year or more to produce such a book. Information now travels so quickly that all time lines are now compressed. This book examines the new Pope through many lenses. We get perspectives on him from several of his writings, including the most recent as Pope, or just before the election to snippets of sermons and other writings from many years ago. the author also shows us that Pope Francis is not just able to talk-the-talk, but how he does, and has, walk-the-walk. How as a Cardinal Bishop he would take the bus and cook his own meals in a humble apartment, and how as Pope he refuses new shoes and feels compelled to literally have hands-on experiences with the people of the world, giving his security detail headaches, no doubt. He understands, however, that he is placed in his position by God to serve others, and not to be served or be seen. His approach to other world religions (Islam, Judaism, Orthodoxy, etc.) and to political parties shows him to be astute and genuinely interested in promoting cooperation and understanding, while refusing to sacrifice principles for expediency. This is an interesting book that explores Pope Francis' childhood influences, adult religious influences and some of his thoughts on a variety of topics affecting the Church. Moynihan also goes out of his way to show the theological continuity between Pope Emeritus Benedict XVI and Pope Francis. Although I would not classify this book as "must read" for Catholics, it is an important book that helps to explain the sources of Pope Francis' more popular/controversial comments and actions which seem This is an interesting book that explores Pope Francis' childhood influences, adult religious influences and some of his thoughts on a variety of topics affecting the Church. Moynihan also goes out of his way to show the theological continuity between Pope Emeritus Benedict XVI and Pope Francis. Well researched book about Pope Francis and his faith. 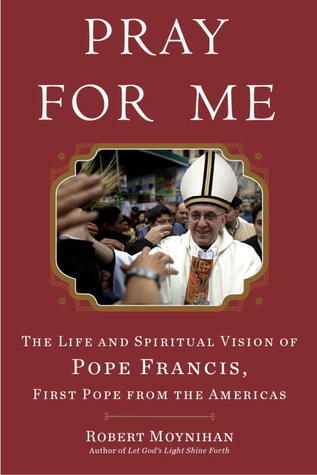 Includes excerpts from his homilies as priest, bishop and Cardinal Jorge Mario Bergoglio. I really got a sense of his devotion to Christ, serving people and taking care of the poor. Well written book which really gave me more insight intoPope Francis and more of an appreciation of his Ministry. Highly recommend for those, who wants to understand intentions of His Holiness! I liked learning about the new pope. The book itself was ok but the info and little tidbits about the pope were good. I really didn't know anything about him before. Interesting insight to the man we now know as Pope Francis. I found the history of St. Francis interesting as well. Enjoyable and offers lots of words of wisdom. A good journalist's record of the first 3 weeks of the Pope's office, with a little biography thrown in. It was really out of order. The biography in Part Two could have gone before the story of his papacy in Part One. And the quotes in Part Three could have been left out entirely. This was good, even though I was mainly skimming to find stuff relevant to my paper. I'll have to come back and retread sometime. Looking to heaven and to our heart. This brief definition of the meaning of prayer sums up the mind of the new pope, which moves from the most sublime things—heaven, the eternal, the absolute, the true, the good, the beautiful—to the most simple, down-to-earth things—the things in the human heart. The first is the realm that transcends all that we do, the realm that is not yet here but that we long for, hope for. The second is the realm of our most intimate privacy, the core of our being, the source of our identity, and of our hopes. And for Pope Francis, prayer connects these two realms. The furthest out, and the furthest in. And to pray, to bring about this “communion” between what is furthest out and furthest in, is radiant, he tells us.